Click Here To See Swamp Monster Pinup In Book! 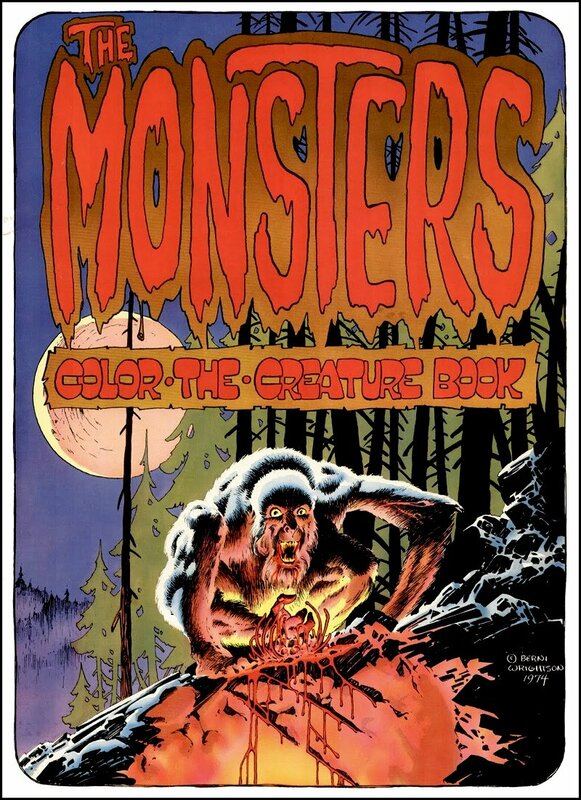 Click Here To See The Monsters Color The Creature Book! 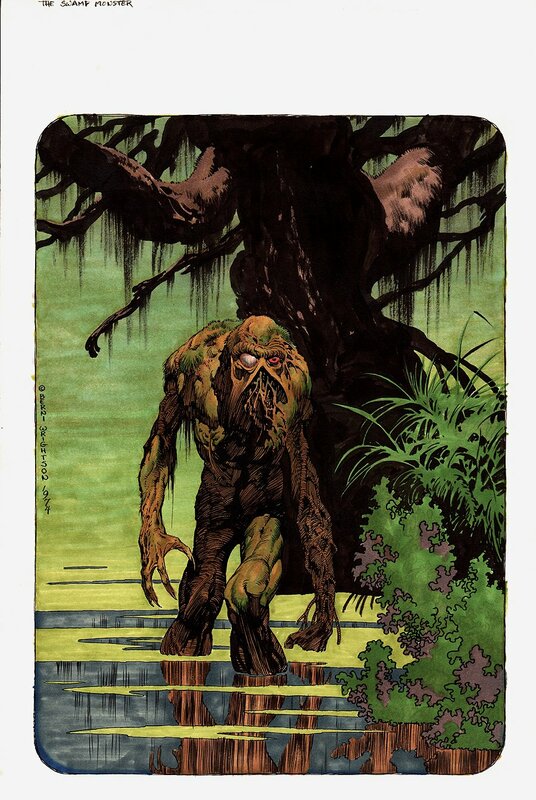 Check out this stunning 1974 PUBLISHED Swamp Thing "cover quality" pinup to "The Monsters Color the Creature Book" drawn by arguably the greatest horror artist of all time.... Bernie Wrightson! When the black-and-white originals for this incredible book were originally auctioned by Russ Cochran in the 1970's, they came with a unique offer. As Wrightson explained in A Look Back: "I offered to color them for the purchasers for the same price they paid for the drawing. If they paid $250 for it, I would color it for another $250. Not many people took me up on it. I have colored only five out of the sixteen. I put in a lot of work coloring the few that I did." And this right here folks...is 1 of the 5, and the GREATEST pinup in the ENTIRE BOOK! Since DC of course owned the rights to Swamp Thing, this creature was simply called the Swamp Monster for copyright purposes! If you ever wanted to own a SWAMP THING cover without spending 6 FIGURES to buy one...this beautiful PUBLISHED pinup is the next best thing! Rendered in color inks on board and signed at left in a unique way. This art is drawn in ink over graphite on Bristol board, and hand colored with superb detail. with an image area of 10 by 14.25 inches on 11.2 by 17.25 inch art board. No cartoonist can capture the essence of horror quite like Wrightson, and this pinup would be considered by many fans to be a "perfect" example by the Master of the Macabre! 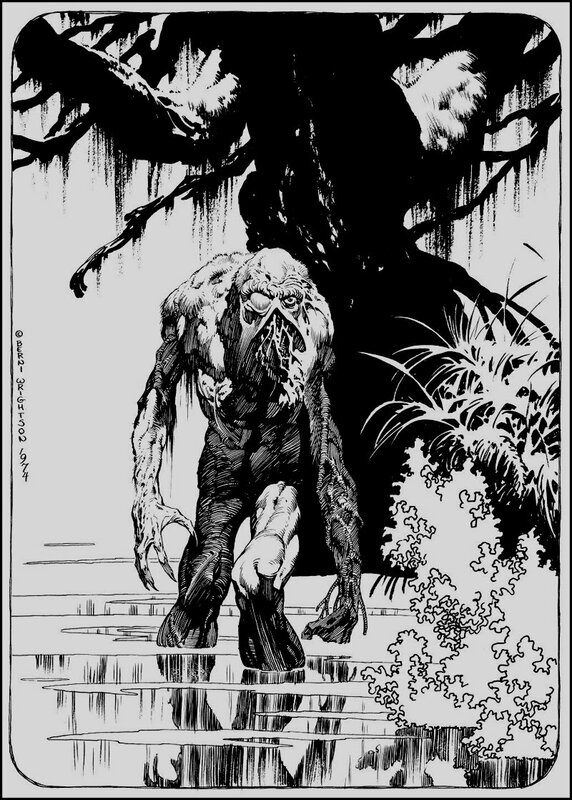 From his groundbreaking work on Swamp Thing, into the "Studio" era with colleagues Barry Windsor Smith, Michael Kaluta, and Jeff Jones, and onto mainstream visibility in the 1980's with projects like Cycle of the Werewolf and Creepshow, Wrightson's accomplishments and influence has been as broad as any artist emerging from the realm of comic art. His work in comics and illustration art is in a class by itself among collectors and fans of the medium. ALL art on our website (including this one) are able to be purchased with VERY fair time payments, and trades are always considered towards "ANY" art on our website! Just send us an email to mikeburkey@aol.com and we can try to work something out.